“We’ve just made walk-in bathing experiences easier and more comfortable,” says Haley Davis, product manager with Mansfield Plumbing. “There are 10 different models of the Restore ACR and they all feature a non-rusting door hinge and handle, water-tight inward swinging door, textured slip-resistant floor, and a high seat that allows the bather to remain upright while being completely submerged. White Restore ACR walk-in tubs come in a 51-1/2″ x 30″ x 40″ size and fit through a standard 32″ bathroom doorway. 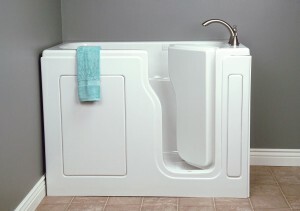 Removable front and end panels allow easy access to the mechanics of the tub. A unique ozonator on the whirlpool and combination bath safely emits ozone into the water lines of the unit to eliminate the growth of bacteria. The units are all backed by a lifetime warranty on the door seal, a 10-year warranty on the shell and a five-year warranty on the mechanics.